Many hands make light work. The Supernatural Amphitheatre deploys some of her best hands to deal with the issue of rubbish/trash/mess/litter/waste. Very thorough, environmentally-aware practices are practised by industry professionals and volunteers. But, the best hands we have are yours. Early on in the piece, a short section of three or four songs will be played, and everyone gets to vote on which one will be the ‘CleanUp Song’ for the weekend. 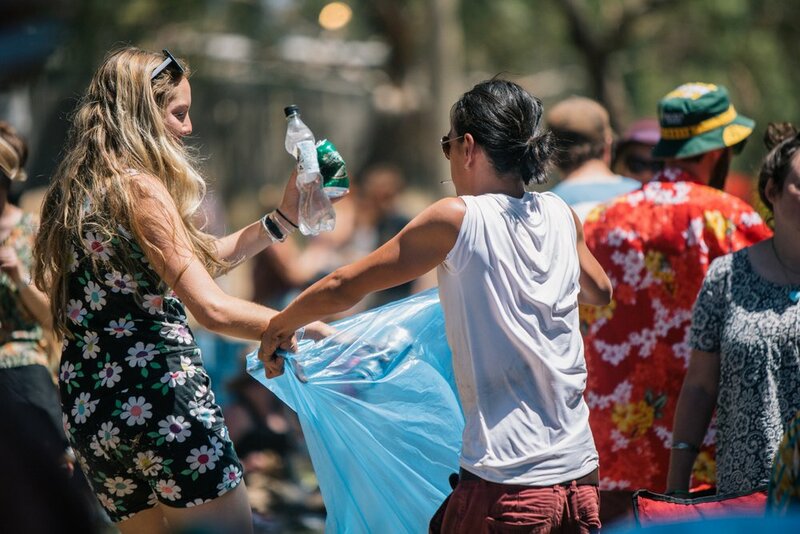 Then, when that track is played at various times over the weekend (two or three times a day), our volunteers hand out hundreds of garbage bags and everyone gets busy cleaning up (which is way easier than cleaning down). Our Volunteers then take the bags to Waste World. Every single thing that gets collected as rubbish over the weekend is sorted by hand and divided into streams, which includes Recycling, Soft Plastics (stuff you can scrunch up by hand), Compost, and General Rubbish. The aim is for the last of these to be the least used. The voting method is simple – whichever song gets the biggest reaction is the winner. For more details on our Green Practices go here.